LegnoDOC snc - Via M. De Bernardi, 64 - 50145 Firenze (Italy). Load bearing timber structures are exposed during their life to some degradation factors which lead, in the absence of appropriate maintenance interventions, to the loss of their structural integrity and serviceability. But the consequences are even more when the structures are parts of historical and/or artistic buildings because their cultural evidence also could be endangered or completely lost. Due to the fact that old timber structures account for a large part of our architectural heritage, mainly in the form of roofs and floors, a reliable, effective and economic procedure for their in situ evaluation is particularly needed. The paper presents a particular procedure which was developed on the basis of several years of experience both in scientific research and on building yard. The procedure is applicable to any kind of timber structure where the wooden surfaces are visible and accessible. However it can be performed also on decorated (painted) surfaces or partly concealed surfaces, although less reliable data can be obtained in these cases. Visual inspection of each element within the structure, including a detailed description of the type, location and extent of defects and alterations (knots, inbark, shakes, fiber deviation, biological and mechanical damages such as rots, insect attacks, fractures, etc.). Wooden species identification, basic geometrical dimensions measurements, strength grading of each element and joints evaluation are also included within this step. Instrumental analysis, by means of appropriate in situ non-destructive techniques, in order to provide quantitative data about some properties and biological damages, especially those located in the inner and hidden parts of the structure; the aim of this step is to complete data obtained from step 1. It includes, typically, moisture content, drill resistance (Resistograph) and sound/ultrasound velocity measurements. Preparation of the final report, including information about structure typology and dimensions, wooden species, strength grade, location and quantification of mechanical damages and residual loadbearing cross-sections. The whole set of data is compiled in tabular form and/or graphic representations by using colour or black and white codes and symbols in order to facilitate and speed up the subsequent work of the technicians (architects, engineers) and of the carpenters. Safety assessment of the structure and design of the restoration plan could be performed on the basis of the collected data. As a mean for illustrating the method through a practical example, reference is made to the case of the so called "Guarini's Towers" of the Racconigi Castle (North-West Italy). 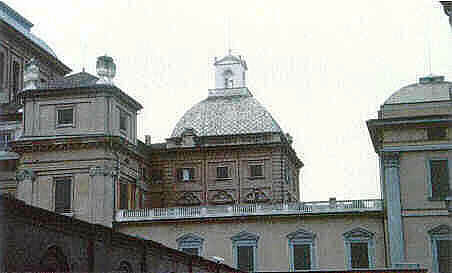 The Castle is one of the various old Savoia family country residences. The towers are part of the main building and were erected by the architect Guarino Guarini at the end of the XVII century. The structure of the roof of the two towers (known also as "twin towers") is entirely made of timber. It consists of a square based loadbearing frame supporting four curved pitches as showed in Figures 1. The main frame (Figures 2 to 4) is composed by two size trusses with a large height to span ratio supporting horizontal beams placed at the top of the trusses; several small-size curved beams completed this frame which is totally covered at the outside by a continuous layer of horizontal planks. The timber species of the frame is invariably oak while the planks are made of poplar. The entire structure lays on horizontal timber elements placed along the internal border of the walls, so as to constitute a sort of continuous ring. While the horizontal beams of the lower level, which actually are long span beams, received supplementary support by the rafters of the large size trusses, the middle level horizontal beams received supplementary support by struts that constitute along with the supported beam an independent structural unit. The castle is now a State property and its administration and conservation is demanded to the local State Conservation Authority (Soprintendenza per i Beni Ambientali e Architettonici del Piemonte). Due to its historical, architectural and cultural value the building is continuously subjected to maintenance works. However, timber structures never received special attention in the past so that recently concern grown up because of the lack of maintenance on these structures, especially that of the roofs, which normally are at high risks of degradation. Therefore, it was decided to start an inspection program of the roof timber structures of the building, starting from the Guarini's Towers, due to the probably longer period of lacking of care. The complete inspection of the two towers (steps 1 and 2) required about 11 days by a 2 people team. The elaboration of data and reporting required about 5 days by one person. The inspection allowed a detailed evaluation of the structures. Structural defects and any kind of decay were detected and evaluated. The trusses were generally interested by only minor decay, mainly due to insect attack, limited to the sapwood parts of the elements. 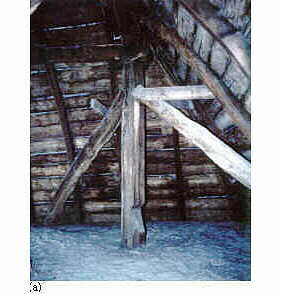 Due to a poor design, the joints between rafters and the truss-posts were often partly disconnected. The horizontal beams, on the contrary, frequently presented medium to severe decay, mainly due to rot, while in few cases only the curved beams showed some decay and/or ruptures. On the other hand, the most of the elements of the basal ring resulted severely decayed by rot. Because of the bad general state of the structures the safety and preservation requirements were not satisfied, leading to the decision to plan possible interventions aimed at restoring and preserving the original structures and their functionality. The Authors gratefully acknowledge the Soprintendenza per i Beni Ambientali e Architettonici del Piemonte (responsible official Arch. Mirella MACERA) for permitting the publication of the data. Table 1: Visual grading of timber in old structures. Grading rules applicable for field inspections, only to the resisting cross-section. Table 2: Admissible strength values and mean values of the MOE (N/mm²), parallel to the grain (MC = 12%). Grades according to Table 1. 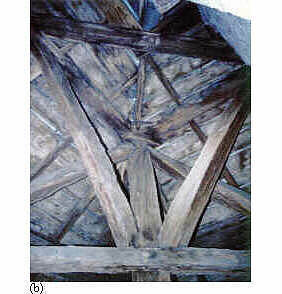 Macchioni N., Mannucci M. - Inspection techniques for ancient wooden structures: state of the art and research needs. 6th International Conference on "Non Destructive Testing and Mycroanalysis for the Diagnostics and Conservation of Cultural and Environmental Heritage" (ART'99), Rome 17-19 May 1999, 2155-2165. Macchioni N., Mannucci M., Zanuttini R. - Non-destructive evaluation of ancient wooden structures. 2nd International Congress on "Science and technology for the safeguard of cultural heritage in the mediterranean basin", Paris 5-9 July 1999, 161.